BIG SALE!! HANGING CRYSTAL PRISMS BIG SALE!! Excellent value priced clear Crystal Prism Balls are pre-strung and ready to hang for wedding decor or by any window in your home. Feng Shui masters recommend hanging crystal prisms in the bedroom and the home as a potent Feng Shui love cure. 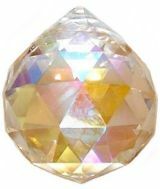 Crystal prisms radiate and increase the precious Yang Chi Energy which is so important for love and romance! 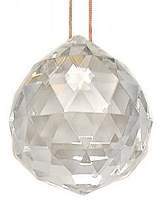 Heavy 30% leaded Austrian Crystal Classic clear faceted prism balls from 30mm to 70mm wide sizes. These crystals can be hung from a string as window prisms or placed on a stand like a crystal ball. Enjoy prismatic reflections of rainbow light anywhere. Perfect Feng Shui crystal for radiating Chi Energy!! 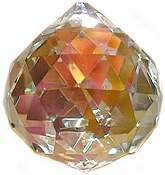 Heavy 30% leaded Austrian Crystal Aurora Borealis faceted prism balls from 30mm to 70mm wide sizes. These crystals can be hung from a string as window prisms or placed on a stand like a crystal ball. Enjoy prismatic reflections of rainbow light anywhere. Perfect Feng Shui crystal for radiating Chi Energy!! 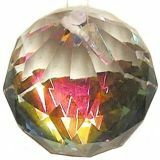 Value priced pre-strung crystal prism hanging balls in prismatic Aurora Borealis crystal. This CLEAR ball has a reflective Aurora Borealis partial coating on the bottom, so when viewed at an angle you see soothing pastel rainbow colors. Use for wedding decor, to liven up events or as a Feng Shui tool to energize a dead space with light and Chi energy. Pre-strung crystal prism hanging balls in eye popping Peacock Crystal. You have two fabulous balls in one. This CLEAR ball has a reflective peacock colored mirror coating on the bottom, so when viewed at an angle you see gorgeous kaleidoscope colors. Exquisitely beautiful, these prisms are a perfect Feng Shui tool to energize a dead space with light and Chi energy. 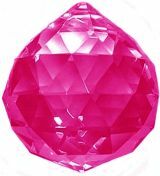 Imported pre-strung crystal prism hanging ball in Light Purple also called Alexandrite can be hung as an ornament or placed on a gold plated stand as a decorative accessory. Use for wedding decor, liven up events or as a Feng Shui tool to energize a dead space with light and Chi energy. Aqua, Amber, Amethyst, Cobalt, Emerald, Pink, Ruby, Sapphire & Topaz. 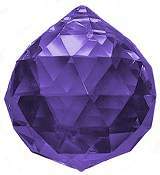 Imported pre-strung crystal prism hanging ball in Dark Purple also called Amethyst can be hung as a window ornament or placed on a dainty stand as a decorative table accessory. Match your color theme for wedding decor, special events or as a Feng Shui tool to energize a dead space with light and Chi energy. Imported pre-strung crystal prism hanging ball in Light Amber can be hung can be used in craft projects, wedding decor, for mobiles . Exquisitely beautiful, these prisms are a perfect Feng Shui tool to energize a dead space with light and Chi energy. Czech and imported crystal prism ball in soothing Aquamarine can be hung as an ornament or placed on a dainty stand as a decorative accessory. In Feng Shui lore crystal prisms radiate and increase the precious Yang Chi Energy which is so important for love and romance! Czech and imported crystal prism ball in hard to find Cobalt Blue can be hung as an ornament or placed on a dainty stand as a decorative accessory. Exquisitely beautiful, these prisms are a perfect Feng Shui tool to energize a dead space with light and Chi energy. Imported crystal prism ball in green also called Emerald can be hung as an ornament or placed on a dainty stand as a decorative accessory. Use for wedding decor, liven up events or as a Feng Shui tool to energize a dead space with light and Chi energy. Czech and imported crystal prism ball in jewel colors can be hung as an ornament or placed on a dainty stand as a decorative accessory. In Feng Shui lore crystal prisms radiate and increase the precious Yang Chi Energy which is so important for love and romance! Czech and imported crystal prism ball in jewel colors can be hung as an ornament or placed on a dainty stand as a decorative accessory. Exquisitely beautiful, these prisms are a perfect Feng Shui tool to energize a dead space with light and Chi energy. Czech and imported crystal prism ball in Pink also called Rose can be hung as an ornament or placed on a dainty stand as a decorative accessory. Match your color theme for wedding decor, special events or as a Feng Shui tool to energize a dead space with light and Chi energy. Czech and imported crystal prism ball in the Ruby jewel color can be hung as an ornament or placed on a dainty stand as a decorative accessory. Exquisitely beautiful, these prisms are a perfect Feng Shui tool to energize a dead space with light and Chi energy. Czech and imported crystal prism ball in the Blue or Sapphire jewel color can be hung as an ornament or placed on a dainty stand as a decorative accessory. Use for wedding decor, liven up events or as a Feng Shui tool to energize a dead space with light and Chi energy.